And things get worse...a LOT worse. New pain, new physical and mental insult (the kind that calls for Depends, and depend is the FMF word)...but the battle continues. The name may ring a bell. 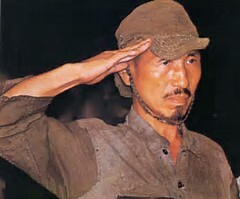 Onoda Hiroo was the last Japanese holdout of World War Two, surrendering only in early 1975. Lt. Onoda commanded a 4-man intelligence unit on the island of lubang in the Philippines, and not believing the war was over, fought on. He didn't just hide; he fought. Lt. Onoda, was told by many, many people that his war was over, but he didn't believe them. So he fought on. Why? There's only one word that fits. Honour. An that's how I feel. I am told my war is done, that it's time to go into hospital and be drugged to end the pain, to give up on the dreams that have sustained me and the hopes that have pulled me forward. Like Lt. Onoda, I've been told that this is for the good of a wier world, one that does not want to see the fight grind on. Better to be a holdout, and fight on. Purpose...I support barbara in the best way I can, so she can work effectively at her job, I write (mainly just this blog, now), I take care of the dogs that have come to our sanctuary, and some days I feel good enough to get a little bit of work done upon my aeroplane. Exercise...mens san in corpore sano, they say. A healthy mind in a healthy body. There are severe limits...I can't run...but I can do endless pushups, and I have a chinning bar that is daily my beloved enemy. I'm dazed and bleeding and needing a change of laundry after each session, but it buys the right to stand int he flames again tomorrow. And last of all, ego and stubbornness. Giving in is for the weak, giving up is for losers, and I simply refuse to lose. I ay be quite wrong. Like Lt. Onoda, I may be fighting a war long lost. But like him, I don't believe that, and I will not stop. I you'd like to read Lt.Onoda's story in his own words, get a copy of No Surrender. It's a great and inspiring read. One to deserve a permanent place on the bedside table. And yes, this is a post for Five Minute Friday. Musical accompaniment is from Sugar Ray, with Someday. I do ask that you be patient with my slow replies to your comments (which we treasure). I'm trying to stay caught up. If you came here from From Messes To Messages, I screwed up...the link was supposed to take you to a different post! But if you'd care to read this too, I'd be honoured. This will, unfortunately, be another short post. I don't like that; it seems to be getting to be a habit. I have to confess that sometimes I do something really, really stupid. The illness and subsequent surgery (that went badly wrong) that precipitated this mess took place before I married barbara...in fact, while I was visiting her in Indiana while we were engaged (at the time I lived in Texas). We were visiting a museum, and I collapsed. She took me to her hometown hospital, where the advice was to have my gallbladder taken out, immediately. Unfortunately, my insurance said they wouldn't pay, that I had to be stabilized and flown home to see an in-state octor. Barb wanted to fight it, but I demurred, and the rest is history. The surgery took place in Texas, was botched, which led to the scarring of the pancreas and the pancreatic duct, which led to chronic pancreatitis for several years...and thus, malignancy. So I think back...what if? What if I had heeded Barb's advice? What if that surgery would have gone well? How would life have been different? And what if I continued that stupid line of thought? Yes, I should learn from it - always take Barbara's advice! But wondering how life would have been different is a bootless exercise, an can only cause harm. For a musical change of pace, how about, straight from Ireland, The Corrs with Breathless? This will be another short one. I've had a rough few days, and Barb is not feeling too chipper. Stay in as good shape as you can so that you can do as much for yourself as you can, every day. The medical 'machine', from hospitals on down, tends to infantilize patients, particularly those who are very ill. The cliche'd "How are we feeling today?" is just the start. Your doctor will 'order' your admission to the hospital, and will 'order' treatments and tests that may or may not be explained. You're 'released from care'...sounds like being released from incarceration, eh? yes, you can walk out, but it does take some nerve. It's so easy to fall into the trap of accepting service when you don't need it...and if you do that too often, eventually you can't do as you once did. You don't use the physical and mental - and moral - muscles, and they wither. To be able to help Barb when she's sick I have to push myself hard every day, harder than I want to, because to take care of her I will have to push through what I thought were limits. So I guess part of the pain I experience is self-inflicted...tomorrow will hurt partially because I choose to hurt, to be able to continue playing my role as husband and help. So here's the appropriate musical theme...yep, you guessed it. Apparently Satan didn't like my Letter To Death, from last week, 'cos he's send a host of new afflictions, and vastly greater pain. The lymph nodes in my armpits, back, neck, and groin are involved. Breathing is like being stabbed, and using the lav is like...well, never mind. Don't try to picture it. Unfortunately for him, though, the devil's pretty stupid, and he ended up bringing a knife to a gunfight. I've seen pain, I've lived pain, and I have beaten pain. This is worse..sure, it's way worse...but it's just more of the same. A beasting that eventually numbs you, and when it does, watch out, because while the Lord claims vengeance as His own, I figure that sometimes he subcontracts. And living well is truly the best revenge. See, I love my life. Yes, it's a nastily painful and messy (see lav comment above) and screwed up life, but it's mine. And I get to dedicate it to whomever I so choose. There are those who have counseled that I curse God and die. I'll listen to that advice...once. After that, it's a date with an oral surgeon and a diet of milkshakes for a few months. Got the memo, there? To paraphrase Puddleglum the Marshwiggle (from C.S. Lewis' The SIlver Chair), I'm on God's side, even if I can;t see hide nor hair of Him. I'm dedicating my fight to the good that He represents, even when He seems to have abandoned the whole thing. Comfort be damned; I will embrace the pain and the humiliation and the despair, and I will turn it into my own body's burnt offering for a good that I refuse to disbelieve even when I can't see it. God's got my back in eternity. And I've got His back here. This is getting ridiculous, and some folks honestly can't understand why I want to live, why I want to see tomorrow. I guess it's because this life, constrained and painful as it is, is still mine. And each sunrise is still a miracle. Now that's picturesque, and it's true, but methinks it's not enough. Why is it still worth it? Every day hour brings the opportunity to do something good. To encourage, to help, to pray for someone...I can't do much physical, but those things I can still do. There's also the opportunity for gratitude. Certainly not "I'm so grateful for my illness as it has brought me closer to God!" There are other ways of getting closer to God, but I am grateful for the perspective I have found, that does not approach God as a giver-outer-of-good-stuff-to-good-followers. I'm certainly not the greatest person around, but I didn't deserve this. And this is validated by the real God that we find in the Bible, and immanent in our lives. He doesn't protect us from bad things, but He brings the equilibrium that gets us through them...even if 'through' means an ending in death. And finally, thanks to the new Heroes And Icons TV channel and their solid Star Trek evenings six nights a week, there's the opportunity to catch up on all of the episodes I missed, from all of the series'. Music today is from The Calling, with Our Lives. I hope you enjoy it! So true. I have waited too long for too much, and the things I thought I would have time for have slipped through my fingers. ...but mostly, I could have been kinder. Please pardon the short post. Been experiencing severe chest pain over the past couple of days, and 36 hours ago was bitten by a rattlesnake.